Vehicle emission is a complex mixture of various gaseous and particulate pollutants. However, majority of the carbon containing pollutants is CO2 and CO, plus hydrocarbon and particle bound carbonaceious compounds. Among the array of pollutants, CO2 and CO constitute more than 95% of total carbon emission. 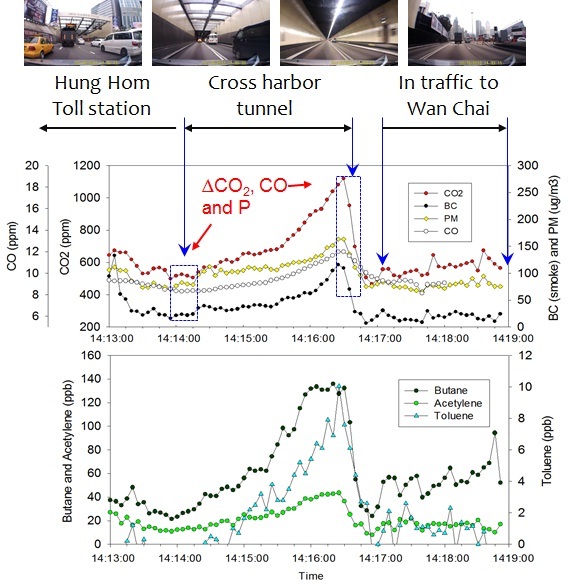 While certain fuel has a fixed ratio of carbon content (e.g., 0.85 for diesel), the incremental CO2+CO concentration can be linked with the fuel carbon cotent and the increase of pollutants levels can be normalized to derive the fuel based emission rates in the unit of g of pollutants per kg of fuel burned. 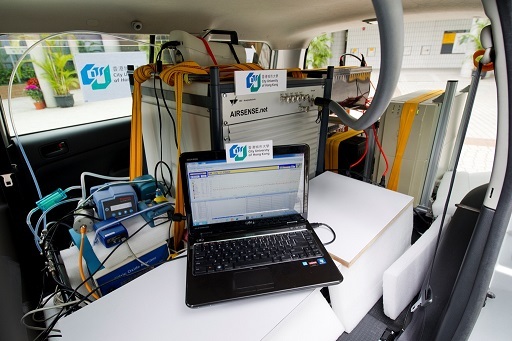 Using mobile chasing approach, high resolution measurement of pollutants from the vehicle tailpipe emissions can be achieved including CO2, CO, PM, Black carbon, gases etc. The On-road Plume Chasing and Analysis System (OPCAS) is developed with integration of various hardwares to achieve real time monitoring of vehicle emission rates while chasing target vehicles. A labview based software is also developed to realtime log, analyze and display pollutants data with integrated GPS, Video recording etc. 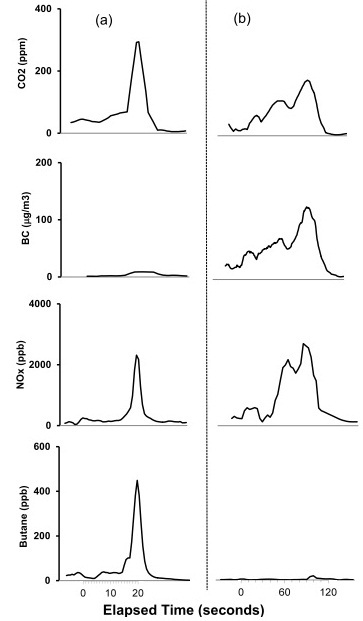 Typical raw concentration profile during chasing. 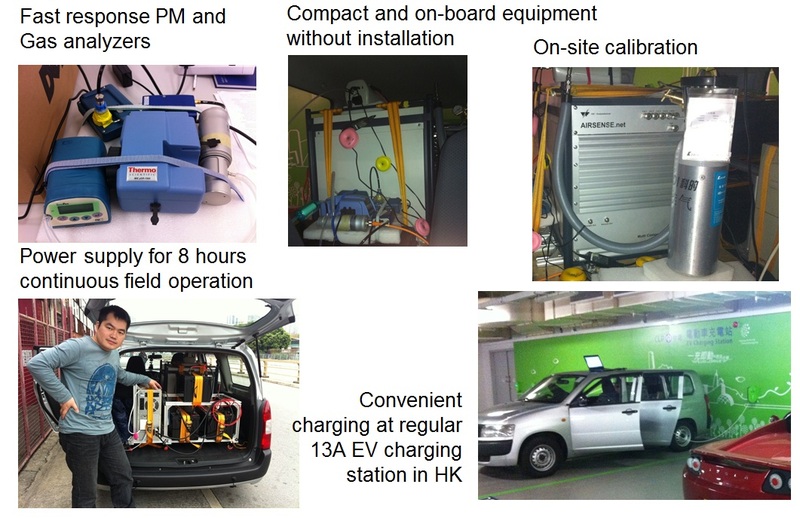 The OPCAS was successfully deployed in Hong Kong to study the fleet emission characterization of NOx, PM and VOC emissions. A Ion Molecule Reaction- Mass Spectrometer (Airsense, V&F Inc.) was used for real time VOC monitoring. Very small fraction of most polluting vehicles was found to contribute a large fraction of total emissions. The maintenance condition of the vehicle engine and catalyst converter also plays an important role in the emission control. The OPCAS can also be used for real time air quality monitoring in dynamic hotspot environment, e.g. tunnel emission measurement. A photo shows how the fast approach can be used to derive the tunnel emission rates by driving through the Hunghum tunnel bore.